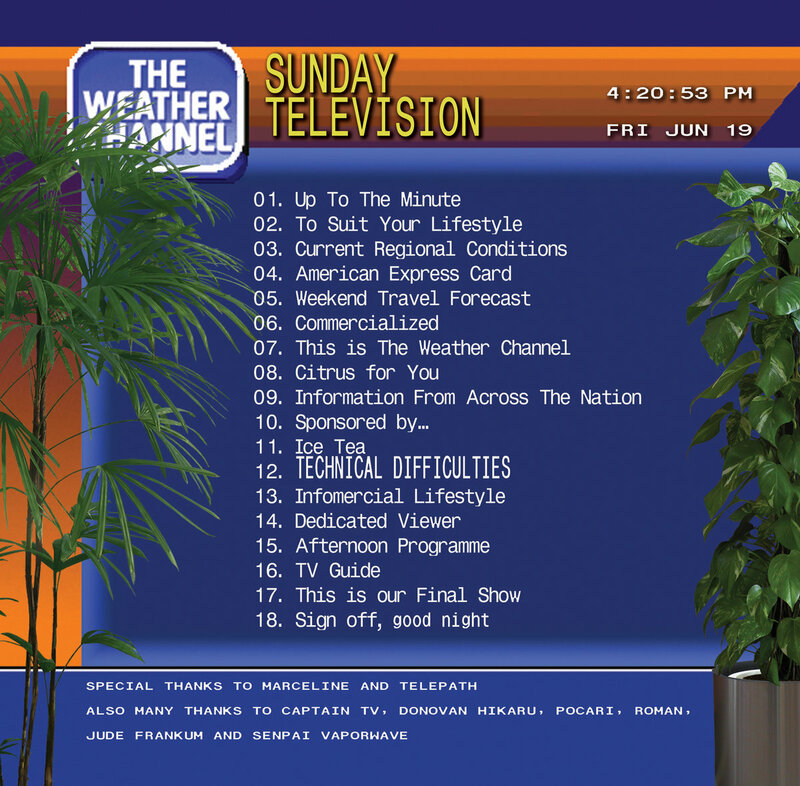 Here’s something new, a vaporwave album themed around the concept of watching The Weather Channel; concept albums are rare in the world of vaporwave so to see one is a surprise, especially considering the nostalgic value that is evident in things such as watching a channel where smooth jazz was played continously 24/7 while weather information played in the background. I haven’t watched The Weather Channel but by god is this album 100% realistic in it’s concept. A lot of it isn’t based on failed dreams and unlike other Vaporwave albums, it isn’t based in fantasy… No this album is the exact thing you’d expect as a 90’s kid. Smooth Jazz filtered out, pitched down and with distortion in the forefront makes for a majority of the sounds featured as well as sound bites from TV intertwined in between; it feels like some INTERNET CLUB stuff but at the same time, it feels really original at the same time. The experience is intended to be consumed by an open mind, meaning you have to be in a different state of mind through either legal or illegal means. With an open mind, you’ll be able to appreciate the artists original intentions as this is an album based on a certain kind of nostalgia… If you don’t have an open mind, you will be turned off by the trippiness, distortion and abrupt surprises… Sure, you can get Smooth Jazz unfiltered but that’s not the intention of vaporwave. The intention is to transport you to worlds you may have been or worlds so far out they couldn’t even exist. SUNDAY TELEVISION tells a story, while it may not tell a full story; it tells a story about a broadcast day at the titular Weather Channel; providing imaginary forecasts and providing the soundtrack to a movie that may make no sense but does upon analysis… There are no characters and no plot points and that’s a good thing because the star is supposed to be you and the state of mind you’re supposed to be in is watching the TV and watching to zone out. To put it short, this is one of the vaporwave albums that may sound the same but sounds totally different once you listen to it. If you’re a fan of The Weather Channel in the 90s then you will love this album, every bit of it is detailed and every bit of it will give you flashbacks to when you were watching The Weather Channel for it’s smooth jazz music or for detailed weather information. This is an essential vaporwave album that you “must” listen to; it provides proof that a concept vaporwave album is possible.